Last year at a work potluck, someone brought one of the most amazing salads I have ever had the pleasure of passing across my lips. I kept returning for more until it was gone and proceeded to ask the chef for her recipe. 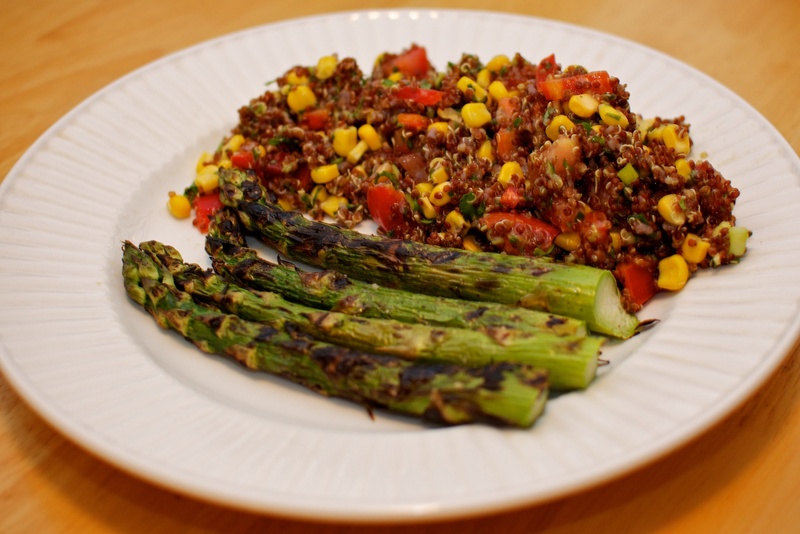 She divulged that the Red Quinoa-Avocado Salad that I feasted on came from this Wegman’s recipe. It was vegan and gluten-free to boot! In all of my variations of this dish, I have skipped out on buying Wegman’s Lemon Vinaigrette and just squeezed a lemon of my own, adding some olive oil and a dash of cayenne pepper with it for the dressing. The salad is refreshing, zesty, and full of mouth-watering veggies such as corn kernels, avocados, tomatoes, onions, and cilantro. You will not be disappointed. For this meal, I decided I wanted some more greenery, so I grilled some thick asparagus on our gas grill (approximately 3 minutes each side). I sprayed the stalks with a light coating of olive oil and sprinkled them with Celtic sea salt and black pepper. The hubs described it as “juicy” and loved the charred flavor from grilling. This is a definite do-over for future meals and cookouts. 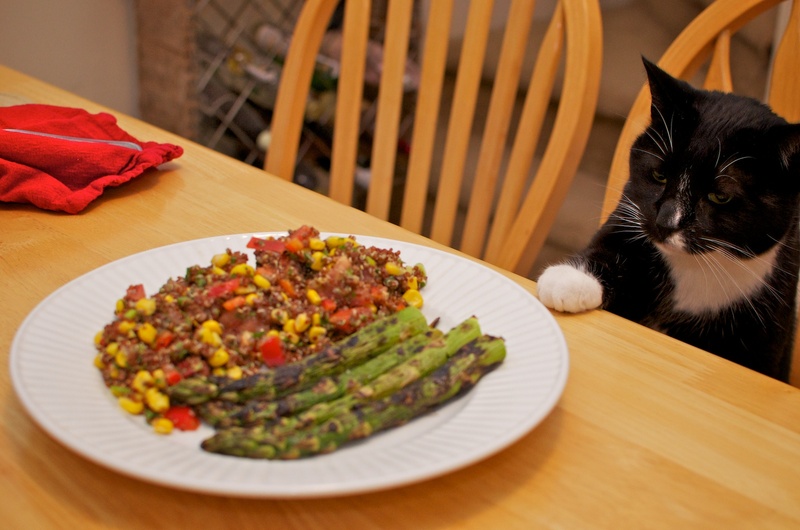 Even our tuxedo cat, Neo wanted in on this meal! Overall, we’d rate this meal as a solid 4 1/2 out of 5 carrots on the veganlicious scale! To be able to cook delicious meals for my gluten-free and Celiac friends, I bought The Gluten-Free Vegan by Susan O’Brien. 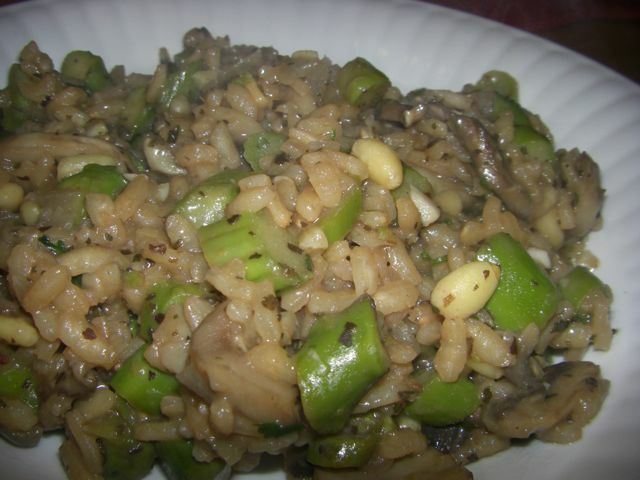 One of the first meals I remember making from the book was this recipe for Asparagus Risotto. I had never made risotto before, and it was a bit time consuming, but definitely worth it! The dish came out wonderfully. I love asparagus, so that made the dish even better. Definitely a must try for the risotto fans out there. I’d give it a strong 3 1/2 out of 5 carrots on the veganlicious scale!